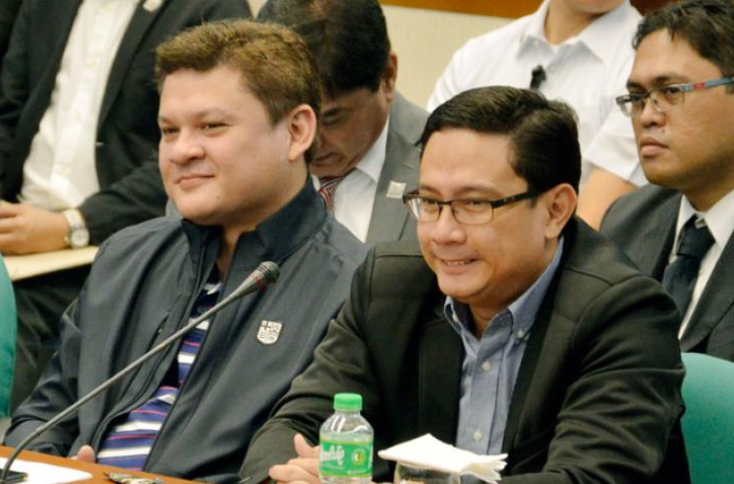 Amid an impending arrest warrant against Senator Antonio Trillanes IV upon revocation of his Amnesty granted to him in 2010, former Davao City Vice Mayor Paolo Duterte along with his brother in law Atty. Manases Carpio files additional criminal charges of Libel against the Senator on Thursday, September 06, 2018. 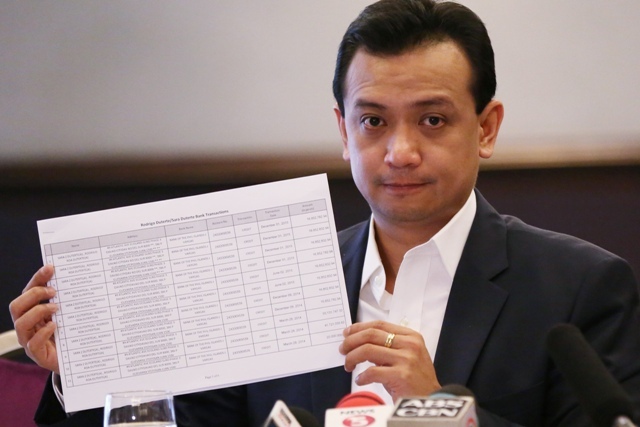 The grievance was filed at the Office of the City Prosecutor in Davao City accusing Trillanes of bearing ‘false, baseless, and unfounded’ claims, suggesting that they extorted money from ride – hailing companies, such as Uber, among others and allegedly conspiring with the Land Transportation Regulatory Board (LTFRB) Central Visayas Director Ahmed Cuison for personal gains. A transcript of Sen. Trillanes’ radio interview with DYAB Cebu’s Leo Lastimosa on September 08, 2017 was attached in his Complaint Affidavit that says, "specifically, respondent indicted me and Atty. Carpio of "pangingikil" (extortion) against UBER in connection with its claimed franchise, and against "similar companies" purportedly in conspiracy with LTFRB RD (Land Transportation Franchising and Regulatory Board Regional Director) 7 Ahmed Cuison,"
Senator Trillanes’ remarks were preconceived to “malign, destroy and kill my good name and reputation locally, nationally, and internationally,” according to the younger Duterte. “It is based on double, if not multiple, hearsay information which he claimed to have received from someone, the identity of whom however he did not even bother to divulge. It is pure black propaganda,” he added. Libel, under the Revised Penal Code is punishable by up to 6 months of imprisonment. The former Davao City Mayor called it ‘quits’ on December 25, 2017 after Trillanes cited his name along Carpio’s into the controversial P6.4 Billion Shabu smuggling from China through Manila International Container Port in Tondo, Manila on May 16, 2017. 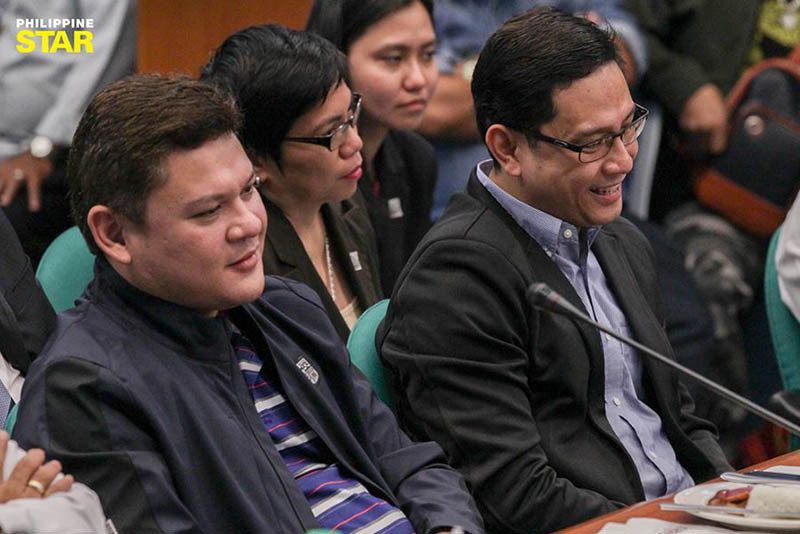 Both initially filed a civil case against Trillanes for similar accusations on December 05, 2017, asking the Senator to pay a total of P6.6 Million in damages including P3 Million for moral damages, another P3 Million for exemplary damages, Attorney’s fees and litigation expenses amounting to P500,000 and P100,000 for nominal charges. NO WARRANT, NO ARREST - Meanwhile, Malacañang on Friday, has finally ruled out the possibility of a ‘warrantless arrest’ for Trillanes since the President himself decides to wait for the courts to issue a Warrant of Arrest rather than ordering a hasty Military arrest. During a press conference in Amman, Jordan where the President still holds an official visit, Presidential Spokesman Harry Roque said, "After a long discussion, the President says he will abide by the rule of law. He will await the decision of the regional trial court if they will issue a warrant of arrest." he said. President Duterte’s decision stemmed from a consultation from his Cabinet members on Proclamation No. 572, which voided the Senator’s amnesty granted to him by the then President Noynoy Aquino in 2011, ordering his immediate arrest. SouthernBackdoor: Someone should teach Trillanes to exercise his freedom of speech responsibly. Even with parliamentary immunity, Trillanes does not have the right to accuse people willy-nilly without solid evidence. curatolo: Sunod na sunod na kaso nayan. Intay kaso naman ni Binay, at yung mga binastos nya sa mga senate hearing.Once mahbuli yan hindi na makakalabas yan sa dami ng kaso. 3rdworldsavage: Looks like Aling Trilling knows something is VERY WRONG with his amnesty papers courtesy of Panot! He is "preparing" for arrest anytime soon! Bogus freedom now on the very front Aling Trilling has been attacking for many years now! See you next to DeLimaw cell block!